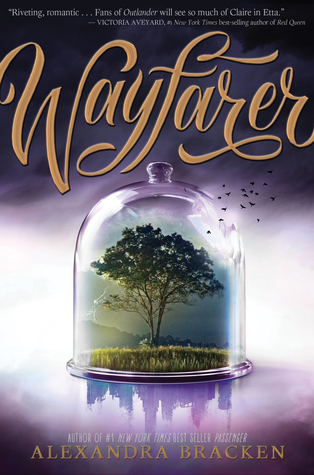 Wayfarer is the second and final book in the Passenger duology by Alexandra Bracken. I read Passenger last year, and I really, really enjoyed the story. I couldn't wait to start Wayfarer to get back into the fascinating world that Bracken had created for us. This series has everything; time travel, pirates, and lots of super intense action and suspense. If you haven't yet done so, I highly recommend you check it out!! There are SO many characters that I love in this series. Etta and Nicholas are both really great main characters, and I really enjoyed both of their narratives throughout the story. Sophia turns out to be pretty awesome also, once you get to know her and understand her better. There are a few more characters in the series that really surprised me as well, some we met in the previous book, and a few that we just meet in the new book. They were all interesting, and really well written! I'm not going to go into details, as I'd rather you read the book and meet them for yourself! After the cliff-hanger ending in Passenger, I was really excited to dive back into the story to see what's going to happen next. The story definitely did not disappoint. I was completely engrossed as I flew through the pages much faster than I expected to, which was no easy feat considering that this book is a whopping 532 pages! The ending though is what really got me, and I finished the book with a huge, satisfied smile on my face. Seriously, it was perfection. Overall; Wayfarer was the excellent sequel and conclusion to the Passenger series! I really hate to see the series end, as I really enjoy the story and characters so much, and I'd love to read even more books by them. But, I still have the Darkest Minds series by Bracken to read, I'm hoping to get to those soon!